MATCO mfg produces a superior 8 inch wheel and brake assembly for use with aircraft requiring less than 700 lbs per wheel. This model uses 1.25 inch TAPER/ROLL bearings. (Check the product comparison table for other bearing and caliper configurations). The MHE8B E SERIES is a 8 inch wheel with 7.0 inch width with an additional 1.31 inch caliper spacing. Bearing spacing is 2.71 inches and axle spacing is 0.68 inches. The total weight of this wheel and brake assembly is 8.3 pounds. The bearing axle diameter is 1.25 inches. The MHE8B wheel utilizes CNC spun aluminum alloy wheel halves for superior strength, lightweight, and resistance to corrosion that is inherently found in magnesium wheels. The MHE8B wheel uses a 1.25 inch tapered roller bearing, designed and rigorously tested for long life and resistance to bearing fatigue. The 'E' series wheel features a single piston brake assembly with an external caliper for easy maintenance. Caliper removal is accomplished by removing two bolts giving easy access to the linings. 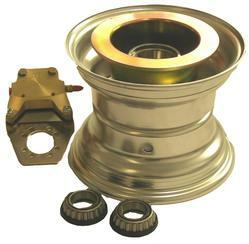 Al-Ni-Brz bushings are used on 'E' series wheels to ensure smooth caliper travel. The CNC spun wheel halves offer a precision surface for use with a variety of commercial tires. The MHE8B can be fitted with the A3A axle for a Cessna 5" bolt pattern or A3C (specify model MHE8B-SC) bolt on axle with Cessna 6" bolt pattern, offering easy installation. Both axles are made of black anodized 6061-T651 alloys. Precision machining on the MHE8B wheel allows for the use of a variety of 8 inch aircaft, ATV, and industrial tires. The rim spacing of 6 inches allows use of many popular high floation tires.